Cometdocs is a free service for quickly converting documents and sharing them with others. 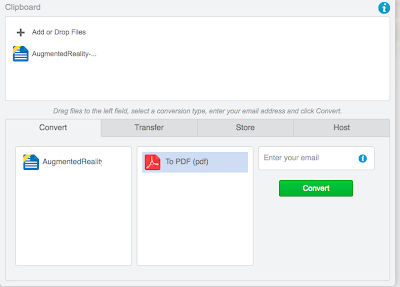 Cometdocs will convert your documents to and from Word, PDF, and Excel. When you use Cometdocs to convert a document you can share directly with others via email. After converting your documents Cometdocs also gives you a public URL that you can post for others to use to download your document. To use Cometdocs just upload a document, select the action that you want performed and enter your email address to share the document. When I tried it this evening the whole process took less than a minute. If you register for an account on Cometdocs, you can get some extra features like more storage space and unlimited file conversions. If you're looking for a quick way to share PDFs or Word documents with students, Cometdocs is worth giving a try. You can do some of the same things with Google Drive, but if you're not a Google Drive user then Cometdocs might be for you. Click here for 15 ways to share files with students.